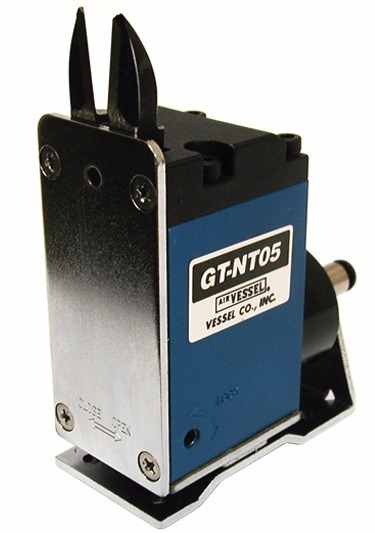 The Vessel GT-NT series sliding nippers boast a small footprint for applications with space restrictions. The GT-NT03-4 is among the smallest nipper in the industry. Unique to this nipper, is the built-in blade opening adjustment and lock. The GT-NT nippers are available in both a PUSH or PULL style to suit your application needs. The slide stroke can be adjusted from 0mm up to 8mm, depending on model. A standard feature of GT-NT nippers is one-touch quick connection fittings.